The rich, royal look of the emerald! This blast of bright spring green conjures up visions of all things lush and lavish… But it is as delicate as it is decadent. Read on to find out how to care for your precious emerald jewels, and what to look for when shopping for this birthstone. Emeralds have always been prized for their exquisitely rare deep green. Only the green garnets are a close competitor for color, and few jewels carry the kind of prestige to land them a place among the cardinal gemstones. The name “esmeralda” or green very simply evokes the exquisite splendor that captivated famous admirers from Cleopatra to Elizabeth Taylor to Angelina Jolie. How do I care for an emerald? Treat them gently. Avoid strong vibrations such as ultrasonic jeweler cleaners, extreme temperatures, and as always, strong chemicals or solvents. Keep an emerald looking its best & brightest with a regular bath – lukewarm water and mild soap applied with a soft brush will restore its luster and remove dirt & oils on its surface. 14K Emerald & Diamond Ring, on SALE! 50% off regular price. See something you like? Visit our online showcase at www.fayesdiamondmine.com & add it to your Wish List! Thinking about emerald jewelry? Why not let us design something around a gemstone of your choice? Ask us about our exclusive custom services. Emeralds are fragile and often contain tiny natural fissures that result in a cloudy appearance. Internally pristine gems are much rarer and therefore more valuable. Any shade of emerald green can be beautiful, so shop for the shade that delights your eye. The brightest, most vivid green is the most desirable color, so be prepared to pay significantly more for an emerald of this quality. Synthetic or man-made emeralds (not the same as simulated or imitation gems) are produced in lab environments. The carefully-controlled conditions produce gems with optimal color and clarity. 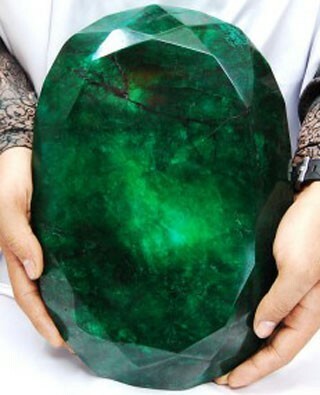 Is it important to you to have an emerald found in nature, and not man-made? Just ask. Jewelers are required to disclose this when selling gemstones. Emeralds used in jewelry are treated with several processes to enhance their quality. These may include treatment with oils or resins that help seal internal inclusions and improve the clarity. GIA (Gemological Institute of America) is the premier authority on gemstones. This helpful guide explains how to determine an emerald’s quality. Previous Post Trunk Show, May 5-7!